Taking a break to keep things tidy around the shop. Coffee filters, candy wrappers litter the place. Doh! My late night java connection yielded some pretty good results. A lot of what I painted was white slip-wax resist-white slip, otherwise known around here as "white on white" (as in the cylinder on the left). The cylinder on the right utilizes regular wax in addition to my special black wax. Fired bisque number 5 with some big bowls. To save space I stacked the bowls with ceramic fiber as a cushion. 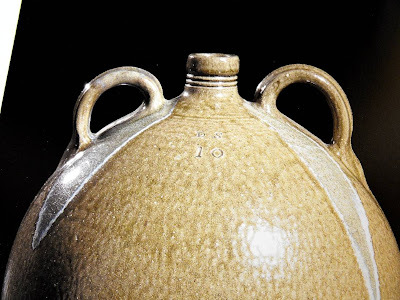 Years ago, Mark Shapiro and I had heard of someone using this technique in bisque firing and stacking bowls. I tend to get weird cracks if I stack big bowls without the wool. I'm not sure of the original source of this technique, but thank you, whoever you are! Here are some other top secret techniques used today. When I cut the rims of these small plates, it leaves a burr along the edge of the cut. Just before bisquing, I "scrub" the burr down with a green pot scrubber. The green scrubbie is just rough enough to take the burr down without changing the edge too much. It doesn't lift out sand or coarse particles like sand paper might. Well, this process leaves the pot dusty. After the bisque firing. I rinse the plates off in a bucket of clean water. Here is a solution to soaking wet pots preparing them for some slip dipping. The wood stove was warm so I set the plates on the rack to dry. No secret associated with the two little hollow rim bowls below. Just liked them. Tz'u Chou peonies and even some birds! I want to do a video of my brushwork technique, so maybe check back for that, too. Not the usual time for a coffee break and you can imagine that the coffee does taste slightly paper-towel-ish, but nothing has been ordinary during the last two weeks. Painting has been picking up here in the evening hours. Good music playing, the wood stove taking the chill out of the air, so I thought I would do a few more boards before the night was over. Hence the late-nite-joe! Much like Kyle Carpenter's cup was the cup of last session, this Hewitt swirl mug has been this session's mainstay. It has been a very comfortable in my hand and has become familiar to my routine. It actually belongs to Lillian! I'm just borrowing it! I totally know where Joe and Cristy are coming from. 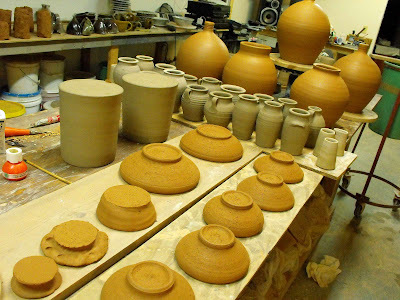 Not necessarily from a triathalete/potter's point of view, but when you're making pots and have to stop to glaze and fire a kiln, it's not as easy as flipping a switch. 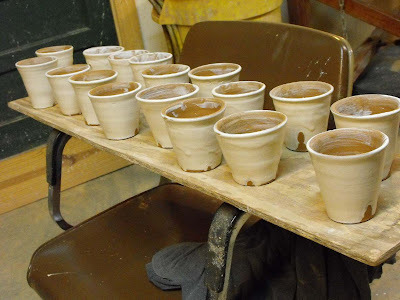 It was such a breezy day yesterday that I turned these cups out before supper, came back and they were just right for dipping in the 6 tile slip! How 'bout that? But, meanwhile back in reality land, there is still a bunch of pots that need leaves. Maybe I should get Sophia to wax them?! Oh, and by the way, this jar was the only one that cracked during the fast drying in the sun/wind! Not bad, but don't you think the handles look a lot like it's cousin "rubbermaid"? Coincidence? Probably not. Be careful of what you have in your studio. It might end up influencing what you make! As I sort out the bisque ware and set up slips, wax resist, brushes, I'm getting my mind switched over from potting to painting! Speaking for myself and my methods they both require momentum and repetition but at he same time seem so different. I'm always blown away by the vigorous brushwork and realism in it's silhouetted peonies and leaves. To borrow Steven Colby's riff, I wish I had made it! Or rather I wish I had painted it! Maybe it's time I gave it the old school effort and try a version on my crockery. 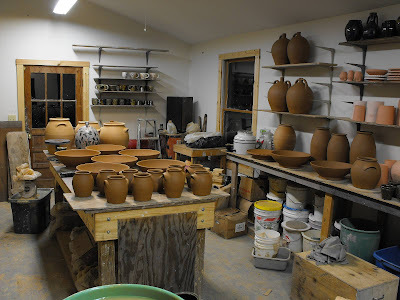 I know I have enough pots for the kiln when, either, I have fired at least 10 bisque firings, or my slop bucket nears it's capacity. At this point, just when I'm at the top of my game at the wheel, it's time to step away from the wheel and set up for painting and glazing! I might spin out a few cups and other filler pots, but that's always a distraction. Not sure what to say. It was a good day, but at this point even a good day may not be enough. 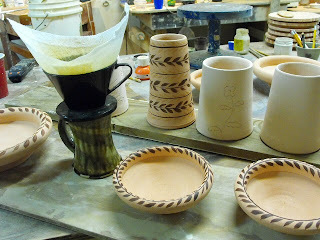 But it's all I can do to finish these pots and get them deco'd before I load the kiln this coming Saturday. 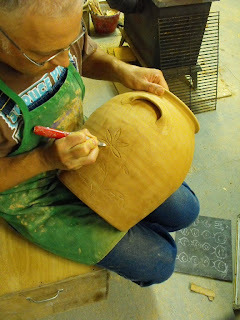 Today's work involved cutting feet on the big bowls and handling jugs! I also handled some of the 2 lb jars. Some of these little pot's handles are simply ridiculous in scale, but I approached these little pots with the idea that I wanted to get the handles on fast and decisively. So some of these were pretty off base, but...no time to fuss! 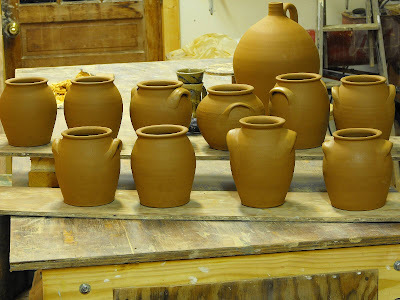 I'm hoping to hear from Turner, who's been my consultant on these jug handles. Basically Tom says bigger, so maybe these are getting there as far as scale goes. 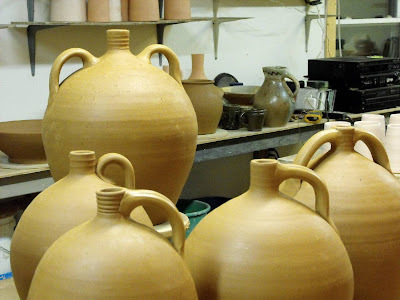 He's right, some of the 2 gallon jugs with thin strappy handles wouldn't inspire confidence when filled . SO each round I hope to get better. 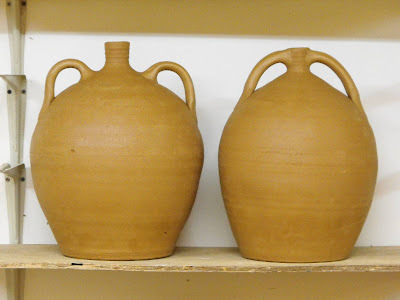 After doing the jug on the right side's handles I made sure to refer to The Potter's Eye and the pot I remembered having two honkin' handles! It just looks strange to me. It has such a different look than the one on the right, a little too streamlined. I miss seeing the spout, which gets lost between the handle terminals. It's a beauty (by Daniel Seagle, 19c. NC potter) and you figure that with about 10 gallons of liquid and the weight of the pot, we're talking about at least a hundred pounds. Those handles better be beefy, right? My jugs are only about four or five gallons and I thought a lot about getting the handles big enough, just in case someone decided to actually use these pots!! Well this is what I'm up to as I head into a week of deco and glaze. I hope you enjoy reading. Let me know if you have any questions or comments, it's always good to hear from ya'll. 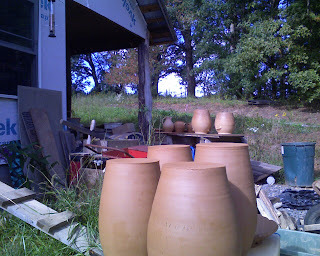 It's a beautiful day for outdoor drying for next weeks firing. Looks like a lot of the pots will be raw glazed! I know that April showers bring May flowers, but what about September showers? In the interest of truth in reporting I thought I would share this Weegee-like image with you. During a sunny afternoon, yesterday, I thought I would get some more drying done, cut some more wood, to take advantage of this rare opportunity before the rains returned. Well the rains returned a little earlier that I anticipated and during supper last night , the pots that on this table were lost. The truth is, I've been trying to cram all of this pottery making in to meet some deadlines after losing two weeks to wisdom teeth. This is what happens when you stay up late too many nights, you lose your edge, you lose your pots! To describe what I felt when I went up to the shop to try to save these from the downpour would require a kind of anger that I'd rather not return to here. But to describe the scene in more unemotional terms may be more helpful. Of course I was upset and wondered whether I'd have enough pots for the firing, now. I ran through a checklist of what was on the table. I believe there were 3-2 gallon jugs, a nice small four handled jar, a few small jars , and two big, 4 gallon jars. My first reaction was that I will remake the pots, which I soon saw as ridiculous. Those pots are gone! Then I remembered a craft show I did many years ago in Guilford, CT. where I lost a whole shelf of pots to a gust of wind and a tent flap. I remembered the heart sinking and the shock. Then I remembered that I had no choice, really, since the show was open, but to clean up the mess and put a good face on ASAP. For it was more critical than ever to sell what I had left and try to cover my losses. 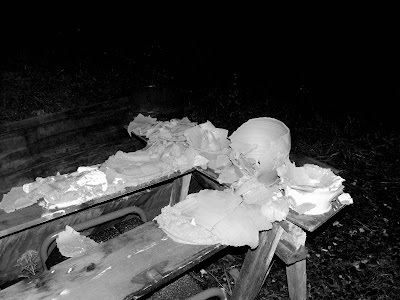 Those pots were gone, there was no glue that would put them back together again. 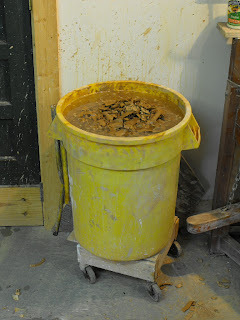 So in this current 'Humpty Dumpty' situation I expedited the clay back to the slop bucket immediately and got to work. There was no time to waste. I remained in a kind of shock throughout the night and this morning. I still have a dull ache in my head, no doubt from the replaying in my mind of what I could have done, or what I should have done, but what good is that? 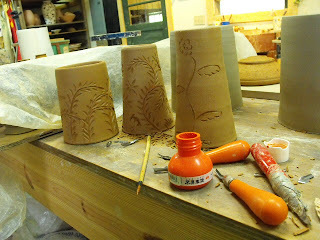 At least I can make more pots, even though it may mean more late nights ahead. So I stayed up late making jugs. Looks like more rain is on the way so I'll being cutting more wood this morning. Here are some of the stars of the early fall meadow. These are about 16-18" in dia. (40.6 -45.7 cm). I used about 16 lbs(7.3 kg) per bowl. All I can say is that if there is plenty of clay I can turn it into pots. It seems like such a simple factor in one's production. Having just pugged the clay, I pulled off a pile of pugs, versus opening a bunch of plastic bags. I can't tell you the difference in mixing your own clay versus commercial clay. It's not for everyone and it probably doesn't compare if you add up time, equipment needed, etc. 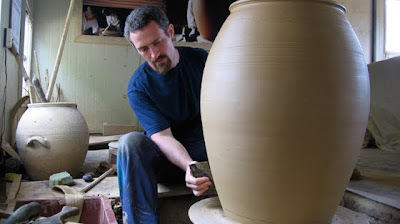 But it makes me excited to make pots and that is probably the single most important factor in any good work! But how do we quantify that? As much as I wanted to, I refrained from using the filing cabinet to stage some drying outside in the sunshine! Until just recently it has been a real sunny and breezy day, perfect to kickoff the bisque cycle. 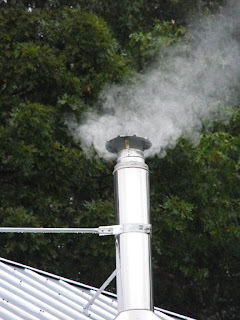 With all the rain we've had, very little was dry enough to bisque, but I managed to get the electric kiln filled up. 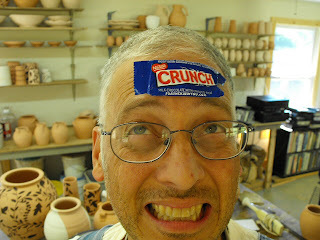 The clay I use is a little bit short. direction a few turns to "close" it up. The flakiness near the bottom is from over drying with my torch and also shortness of clay, but it's a nice texture. After more ribbing, though, it goes away. From last night. These jars range from 15-18 lbs. 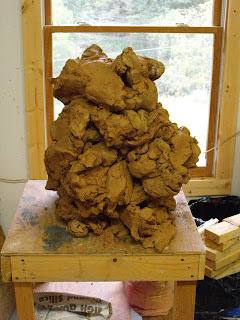 (6.8-8.2kg) in clay. Thrown in two sections using caps. I'm going to make a few more of these today. I need to fill a kiln up! Here's how I cut and slam the clay before I wedge it. My good friend Martina Thies first showed me this technique where she learned it in Germany during her apprenticeship. 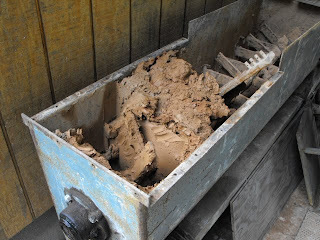 I later saw Vernon Owens mix his clay this way. Up until about 5 years ago, I never used a wire to wedge, but now I can't live without it! 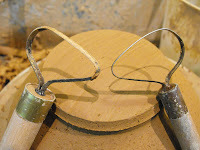 It's very helpful to mix a harder or softer clay together quickly and evenly. This way you can get just the right consistency you need. I had set the clay out to dry a little because it was too soft for throwing bigger pots. The clay dries in humps on my table. 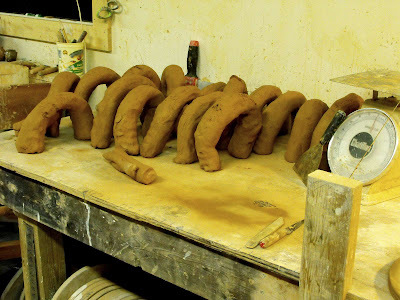 But the problem is that the clay dries on the outer surface and the inside of each hump is soft, still. Also where the clay youches the table it is drier. The cut and slam technique quickly blends the soft and the hard! Ahhh. Now if I can just get these pots drying. I might set up my file cabinet drying rack! I hope you all in north Georgia are getting some of this sunshine. Stacey and I were both home working yesterday and it was nice to know we were both doing what we love. 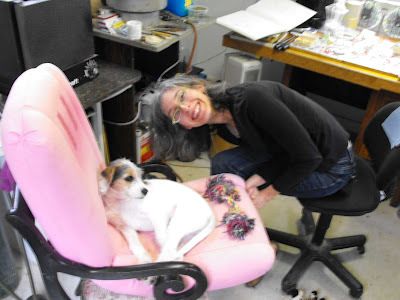 Here is my lady and our dog Jack, enjoying some blurry quality time in Stacey's jewelry shop. Stacey is working on some new pieces for the fall and upcoming shows, including our annual Holiday sale in December. 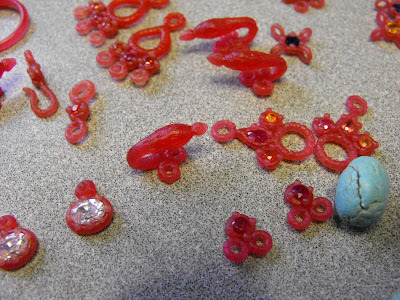 The above are special red wax models that will be "sprued" together and cast in either 18k gold or sterling silver. Notice that some have stones already set into the wax. The wax will melt out during a burnout phase in Stacey's little kiln and the stones will hopefully remain in place in the plaster/silica mold! Pretty cool. See more of my love's work here. I thought this finished piece was particularly interesting. 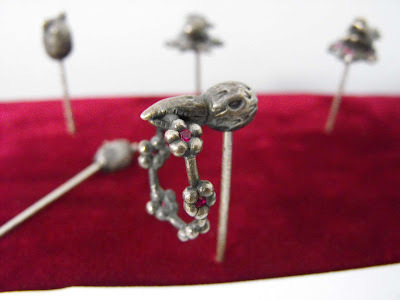 It's part of a set of cast Sterling "toothpicks" or small skewers you might want to use in a Martini, say! They are some of the most interesting toothpicks you will find! Meanwhile up on the hill, I attached lots of little tiny handles to my 1# jars and threw some bottles and such, trimmed some rolled rim bowls, and did some incising which I talked about earlier in the day. I used some orange sumi-e ink that I had lying around to map out the carving. 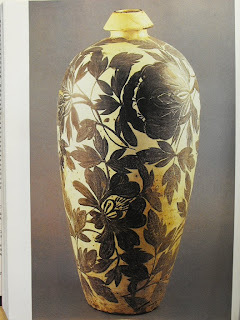 I learned that trick from this blog, and I think Ron uses tempera to paint on the patterns?? Tomorrow I hope this clay will be stiff enough to throw some big pots. 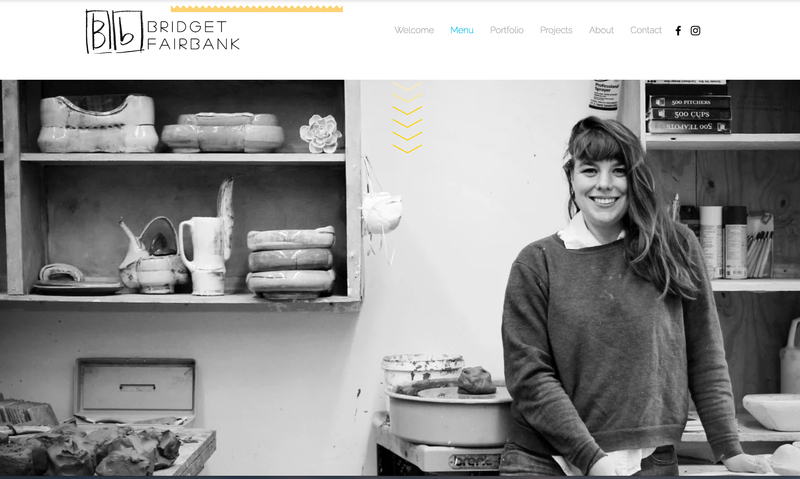 This week is going to be crucial in making enough pottery to fill the kiln. 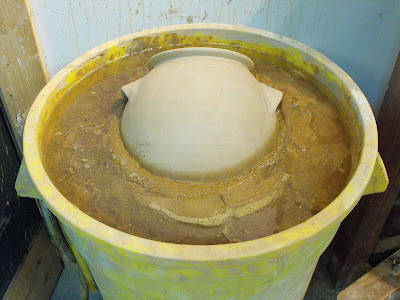 If I have a couple dozen larger pots it will make the kiln less vacant. But it will also be important to enough table ware in there as well. I have two shows that I'll be doing in October. I'll tell you about them soon. It's late and I'm heading quickly to my pillow. But before I sign off, I wanted to ask you all to try the comment system and help me work out some bugs. I changed some settings yesterday to helpfully deal with continued problems with Disqus. If you could take a moment and say Hi, so that we can see if it works better, that would be great. I'm sorry that this issue keeps coming up. If it's doesn't work, I'm prepared to switch back to blogger/google's commenting system which seems to be more reliable. Thanks for taking the time to read and follow my tribulations, and hope that you will continue to swing on by. I do live in the mountains at an elevation of about 2600 ft. (792.48 m). And tomorrow is the first day of Fall. But the real reason fot the wood stove burning on this last day of summer is the relentless wetness and sogginess that is my pottery studio. So I've got a lil' fire burning to dry out some pots so that I can start to bisque fire. 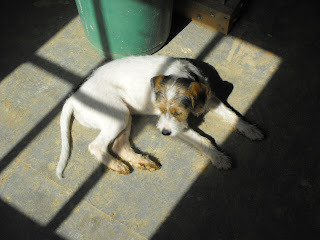 Knowing that the sun shines somewhere is my one comforting thought. But that ain't gonna dry all these pots out here, today. I hope the sun is shining for you today! I don't know if this is something I want to invest in. We'll see. There may not enough time for this kind of exploration this week, but do I really have a choice? Today is the last day of summer and tomorrow Autumn begins! To attempt to cover what happened over the weekend would be futile. So many thoughts go through my mind as I work, I wouldn't want to bore you, but I'll try to mention a few things. It rained mostly and pots sat wet on their boards. Mighty Micah came over Saturday to help cut and stack wood. We got a good amount done, and will finish later this week. We'll see how it burns being just about two months or so from being completely green and also getting a fair share of rain as it sat in the wood lot near the kiln. Hey! two months is plenty of time to cure out a pile of poplar, right?! Well, I know it will burn (eventually), it's just a matter of how much green wood I'll use compared to fully aged, ripened, dry and snappy poplar that I've had for the past two firings this year. I decided to build a fire in the shop on Sunday in an attempt to dry out the place after all the rain. The doors were sticking too much from the swell! When I opened the lid of the wood stove, I was shocked to see several expired bats. They must have come into the vacant chimney pipe and gotten trapped. I love bats and depend on them to keep the mosquito population down around here. But, I'll have to put some screen around the chimney opening so this won't happen again. Mea culpa. Speaking of winged creatures, it has been a banner year for them with all the rain, I suppose, but also the beacon that is the shop at night. 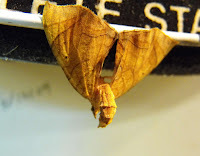 Here are a couple of interesting moths that I captured on "film" the other night. 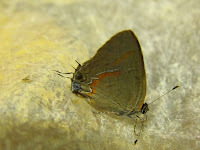 Any moth experts reading? I've never seen these before. 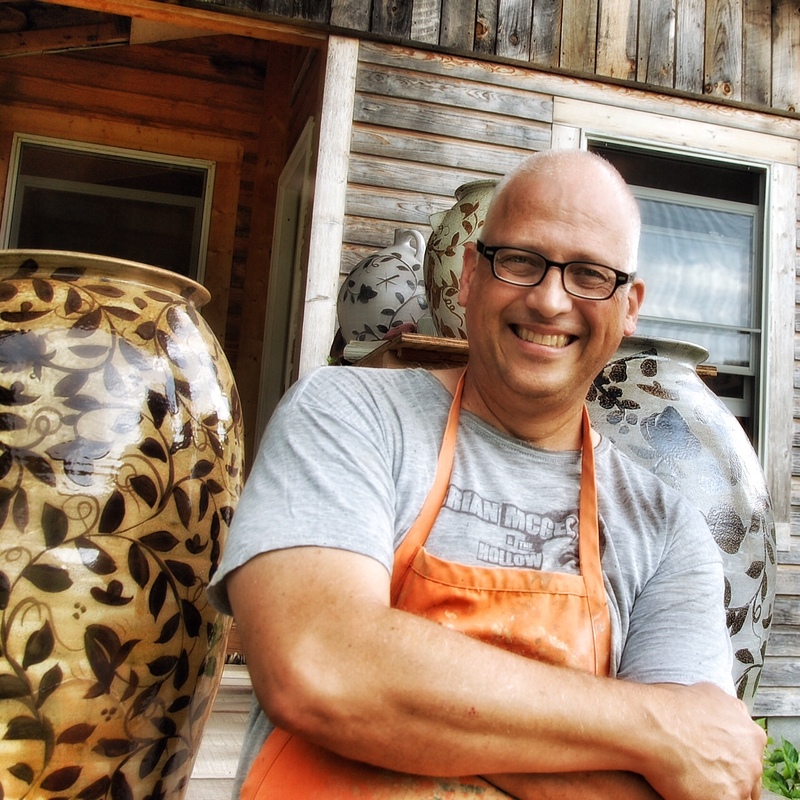 Seagrove potters and bloggers, Meredith and Mark Heywood stopped by for a visit today, but I failed to snap a picture of my buddies because I was busy working my jaw. Hopefully Meredith will send me a picture. I saw her snapping some. Penland potter and neighbor Catherine Dotson was their guide! It was a great rainy Sunday afternoon visit. Evelyn came up to fetch me away from my work and take me down to the house for supper. 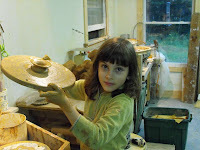 But she was captured by what seemed like a lot of fun: listening to loud rock music and making pots! 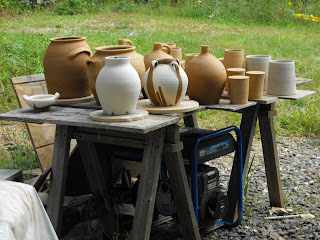 So I gave her some clay and kicked the treadle for her and she made a few pots before we headed down the hill to eat. She was telling me how she wanted to decorate them for the firing. That's my girl! I head into that second and last week of making before I switch to shop over to a decorating and glazing venue. I've filled the kiln in two weeks before, but it's a frenzy. I'll try to keep you up to date on the "fun". 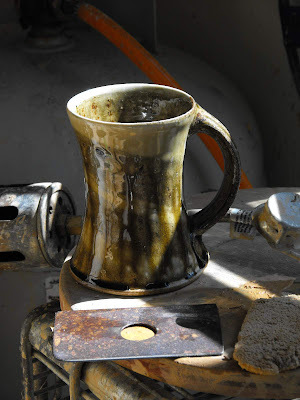 Potter Adam Field writes at the pottery blog, "Dirt" about his adventures between his home in Durango, Colorado and the Onggi potteries of South Korea. This month Adam is being introduced to an even wider audience through is solo show at TRAX Gallery in Berkeley, California. Adam's show is Online! and you can see it and buy up all of the remaining pots here! Tell'em I sent you!